Cheapest insurance scheme Pradhan Mantri Jeevan Jyoti Bima Yojana is available in market now.Under this scheme you can purchase insurance cover of 2 Lac rupees with premium of 330 Rs/ per year. This means you are paying less than 1 rupee per day to avail benefit of Pradhan Mantri Jeevan Jyoti Bima Yojana. Although this policy is cheapest insurance policy, here are few points you should know before buying this policy. Policy Term of Pradahan Mantri Jeevan Jyoti Bima Yojana is 55 years. This limit is fixed and cannot be extended. Other policy available in market provides extended policy term up to 75-80 years. Maximum Risk Coverage available under this scheme will be 2 Lac. This amount will be paid to nominee in case of natural or accidental death. This amount is very less and will not be sufficient for any family to sustain for long term. Pradhan Mantri Jeevan Jyoti Bima Yojana is plain vanilla plan. You can not avail any additional rider like accidental rider, critical illness or premium waiver with this plan. Pradhan Mantri Jeevan Jyoti Bima Yojana is not available for everyone. This insurance is only available for age group of 18 years to 50 years. So if your age is more than 50 years you cannot take this policy. Pradhan Mantri Jeevan Jyoti Bima Yojana is directly linked with your saving bank account. This policy will continue till you maintain balance in your account for renewal. Also remember that closure of bank account linked to this policy lead to closure of this policy. Pradhan Mantri Jeevan Jyoti Bima Yojana follows single policy single person rule. If you have multiple bank accounts it does not mean that you can buy multiple Jeevan Jyoti Bimas to increase risk coverage of 2 Lac. Although you purchase multiple policies single policy will be applicable and risk coverage will be 2 Lac only. This is very good scheme and you can definitely buy insurance from Pradhan Mantri Jeevan Jyoti Bima Yojana, however you must remember point discussed above while buying this policy. This policy will be additional cover, you still need good term plan as preliminary requirement for risk coverage. You can go through rules applicable on PMJJBY from here. What is your view on Pradhan Mantri Jeevan Jyoti Bima Yojana? Do share it in comment section given below. Nice information ! however question is how many life insurance term plan can a person have? since I enrolled for Pradhan Mantri Jeevan Jyoti Bima Yojana, i would also like to opt for other life insurance term plans, can i go other life insurance along with Pradhan Mantri Jeevan Jyoti Bima Yojana? 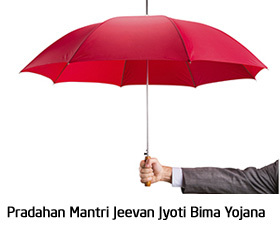 do i need to disclose “Pradhan Mantri Jeevan Jyoti Bima Yojana” to other life insurance company? Vishal, You can take number of term insurance policies based on your requirement. Yes, You need to disclose about these insurance policies while buying other policies. There is no doubt that this is a very good scheme promoted by Govt., which offers life insurance for very low premium. The SA is very low (2 lakh); however, one can consider this as an additional life insurance coverage. Once can consider suggesting this option to low income friends/house-maids/drivers etc.. Premium of Rs 330 and 12 is nothing. One can consider this as a special gift to them by buying this and gifting it to them on their behalf. I know it may not be useful for those who may be reading this post (hoping your earnings are at a higher level and feel these schemes coverages of Rs.2 lakh a meager). However, there are many who are totally deprived of insurance due to not knowing the importance of insurance. I sincerely request all of those to spread this unique awareness and make them to be insured. Even though I personally have enough Life and Accidental Insurance coverage, I still enrolling for this scheme.